Changing my mind in the garden can bring on some extra work. Changing my mind on what book to read in June and July for the Garden Bloggers’ Book Club just took some thinking through while working in the garden this weekend. So ignore what I previously posted as the book selection for June and July. The selection is really, truly going to be My Summer in a Garden by Charles Dudley Warner. Why the change? Oh, a variety of reasons mostly having to do with the books originally selected being a bit too difficult to get, at least for me. As I wrote to one person who regularly participates, I like to choose books that are of general interest to all gardeners wherever and whoever they may be, that are also available to everyone regardless of means or location. So I look for books that are likely to be in a public library or that have multiple used copies for sale on Amazon. With “My Summer In A Garden”, there is the added bonus that the full version for the book is on Google Books, so you don’t even have to buy it. You can read it online or download it to a PDF. If you are thinking you have no time to read a book these next few months, you might reconsider as this book is only one hundred pages, not counting the introduction. Warner writes a chapter for each week of the summer, spanning some 19 weeks. And if you still can’t imagine finding time to read even 100 pages, you can still join in the virtual meeting of the book club by posting about your own “summer in a garden”. You’ve got some time to think about it, as the virtual meeting post will go up on July 31st. Questions or comments? I am always happy for constructive input, feel free to send me an email or leave a comment. 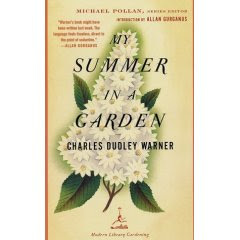 Again, the book selected has been changed to “My Summer in a Garden” by Charles Dudley Warner. I hope you’ll join me in reading this gardening book, just right for summer reading. Thank God the lone copy our library owns was on the shelf, now with a hold placed by me. I thought I was all ready with "Married to my Garden" but that's me second-guessing you! Read it online at Google? Do we prop pictures of flowers out in the garden instead of growing the real thing? Oops, sorry, it's the old-fashioned librarian in me ranting! (That wasn't very constructive, was it?) Must catch up to millennial thinking. A wonderful selection, Carol. I look forward to reading it. The book sounds good. I had heard about it a couple of weeks ago on the radio. LostRoses...I almost chose "Married to My Garden" after the wonderful review GottaGarden gave it, but it is not readily available. Amazon tells me my copy will ship in early July (yes, I ordered it!) and the publishers website for shopping doesn't seem to work. I'm sure it will eventually be chosen. Carolyn Gail...I think you will enjoy it, especially if you grow or have grown vegetables. Myuptopia...I'm not surprised you heard about it on the radio. I think Warner is quoted a lot. Yay, hooray! I own it, I can't wait to read it, and it is short enough so I can fit it in with my other book (and with being outdoors a lot). A perfect selection. Thanks, Carol. Nan... Thanks for the affirmation of the selection. I hope you enjoy the book, and I look forward to your review. I know that somewhere this question is answered, but I can't seem to find it. When I finish the book, do I post about it on my blog? How do I let you know I have written about it? Thanks, Carol. 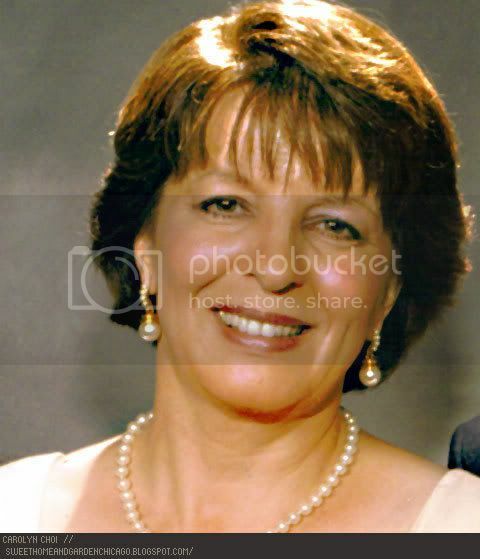 Nan... When you are done reading the book, post your review on your blog and then leave me a comment on my blog or send me an email to let me know about it. Then I'll include a link back to it in the "virtual meeting" post on July 31st. I will have to look for this at the library, but that's great that it is free for download too. A lovely idea - I would love to join in - only 100 pages, so I hope I can find the book. Today is Tuesday, the day our travelling library calls, so I am off to find the book now.